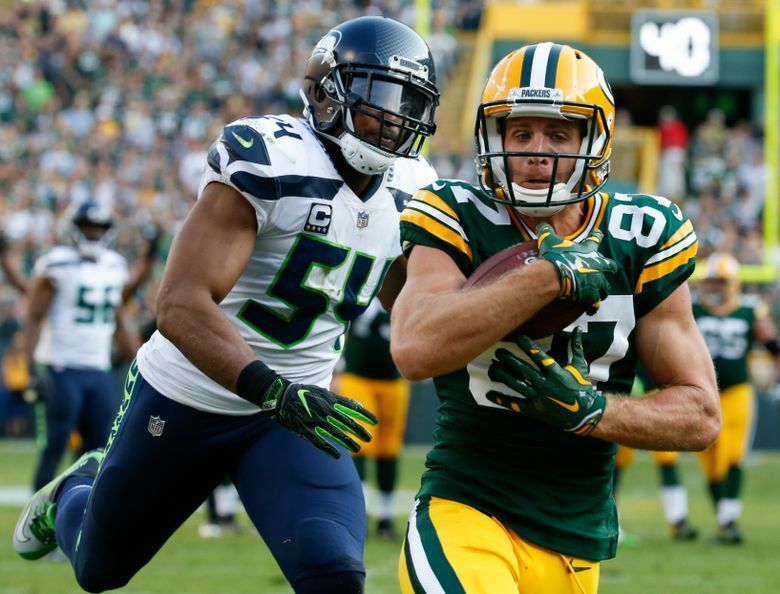 Another year, another visit to the Seahawks by veteran receiver Jordy Nelson, again a free agent, who is set to make a trip to Seattle on Tuesday, according to Adam Schefter of ESPN. Schefter says the Patriots, Titans, Chiefs, as well as the Raiders, also remain interested in Nelson. Nelson is a favorite of Seahawks general manager John Schneider, who was with the Packers when Green Bay drafted Nelson in the second round in 2008 out of Kansas State. Schneider became Seattle’s GM in 2010. After he was released by Green Bay last year, Nelson visited the Seahawks before signing with the Raiders, a two-year deal worth up to $15 million. But after acquiring Antonio Brown last week, and with Nelson set to have his $3 million base salary for 2019 guaranteed Friday, Oakland released him last Thursday and he is again free. Nelson will turn 34 on May 31 and is coming off a season that pales statistically with the best of his years in Green Bay, with 63 catches for 739 yards and three touchdowns and an average yards per reception of 11.7 compared to his career average of 14.0. But he was playing for a pretty woeful Raiders team, and his number of receptions was more than any Seattle player had in 2018 (Tyler Lockett led the Seahawks with 57) and his yards would have been second behind the 965 of Lockett. The Seahawks almost certainly wouldn’t make a huge investment in Nelson, but they might be willing to essentially trade Nelson for Jaron Brown, whom they signed a year ago as a free agent but who struggled to produce consistently, with just 14 catches for 166 yards, though he did score five touchdowns. The Seahawks could save $2.75 million against the salary cap if they released Brown, money they could use to sign Nelson. The Seahawks increasingly used David Moore as the third receiver as the 2018 season wore on, but he struggled to produce consistently down the stretch and finished with 26 catches for 445 yards. Seattle might well view Nelson as a good bridge to give Moore a little more time to develop. Seattle also simply needs to add some depth at receiver, especially with Baldwin coming off knee and shoulder surgeries in the offseason. And one other bonus — because Nelson was released he would not count against the compensatory pick formula. Via OvertheCap.com, the Seahawks have at least three, and possibly four, comp picks coming in 2020 for free agent losses suffered so far this year. Any signings of players whose contracts expired Wednesday could count against the formula. But players such as Nelson, who was released, would not. It’s thought Seattle wants to try to maximize its comp picks for 2020 after not getting any in 2019. Nelson is the second reported visit for Seattle since the free agent signing period began last Wednesday. Defensive tackle Caraun Reid, who most recently played for Dallas, was reported to have visited Thursday by ESPN’s Field Yates. Reid has played in just 18 games the past three seasons, 10 last year with Dallas, and projects as a likely inexpensive option to add some depth in the interior. Reid played 185 snaps for Dallas last season and had 10 tackles and half-a-sack. He played at Princeton and entered the league as a fifth-round pick of Detroit in 2014. He has scored two touchdowns in his career, one coming at CenturyLink Field in 2015 when he picked up a Wilson fumbled and returned it 27 yards for a score. That was the game when Kam Chancellor punched the ball out of Calvin Johnson’s hands to preserve a Seattle 13-10 victory.